Rainforest at Tampolo on the Masoala Peninsula. The peninsula has been heavily logged for rosewood in the wake of the 2009 coup d’etat that brought Andry Rajaolina to power in Madagascar for the first time. Image by Rhett A. Butler. His past administration faced charges of corruption, especially regarding natural resource management. Top officials, including Rajoelina himself, were rumored to be involved in the illegal rosewood trade, which flourished during his time in office. Andry Rajoelina is set to be sworn in as president of Madagascar on Jan. 19, following his victory over longtime rival Marc Ravalomanana in the final round of the country’s presidential election last month. Many conservationists and civil society representatives were disappointed by the result, as they deemed Rajoelina’s last stint in power a failure. He served as de facto president from 2009 to early 2014 after a coup d’état carried him to power. His administration was beset by corruption, especially regarding natural resource management, according to numerous reports. Top officials, including Rajoelina himself, were rumored to be involved in the illegal rosewood trade, which flourished during that period, damaging Madagascar’s sensitive and highly biodiverse forests. “The lack of transparency in the management of public resources was a persistent problem, and the rule of law was weaker than ever before,” Ketakandriana Rafitoson, executive director of Transparency International – Initiative Madagascar, wrote in an email to Mongabay about Rajoelina’s time as de facto president. “The trafficking of natural resources (rosewood, gold, gems, etc.) was growing wild,” she said, adding that government corruption levels spiked from 2009 to 2013. 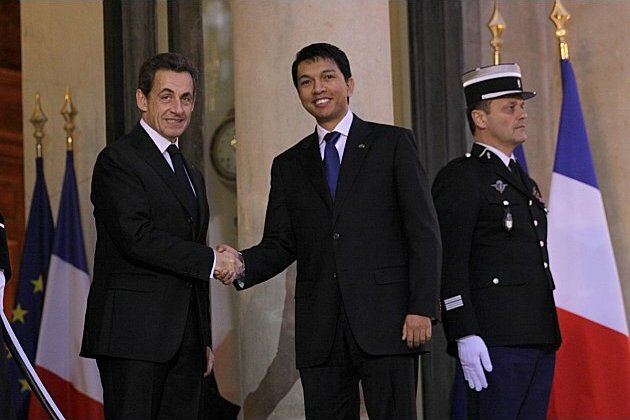 Andry Rajoelina, who will be sworn in as Madagascar’s president, with then-president of France Nicolas Sarkozy in 2011. Unlike his rival Marc Ravalomanana, Rajoelina is seen as having close ties with France, Madagascar’s former colonial power. Image by Jeannot Ramambazafy via Wikimedia Commons (CC BY-SA 3.0). In the late 2000s, Rajoelina was the young, hip mayor of Antananarivo, Madagascar’s capital, the second most important political position in the country. He quickly became the face of the opposition to then-president Ravalomanana. Ravalomanana had twice been elected but his popularity was declining because, among other reasons, he planned to lease nearly half the country’s arable land to a South Korean agribusiness firm for 99 years. After months of demonstrations, some of which prompted police violence, Rajoelina’s camp won the support of much of the military. In March 2009, the military forced Ravalomanana to resign and go into exile in South Africa. Within days, Rajoelina became the leader of the so-called “transition” government. The anti-Ravalomanana political parties coalesced around him because of his charismatic personality — he was once a disc jockey and later ran a successful media business — and because, at just 34 years old, he lacked the baggage of other potential leaders. However, Rajoelina quickly accumulated baggage and had difficulty establishing credibility. The African Union condemned his rise to power as a “non-constitutional” coup d’état and suspended Madagascar’s membership. Rajoelina was barred from speaking at the United Nations General Assembly in New York. Many donor countries pulled their funding. This had a significant impact on the country’s economy; during his predecessor’s term as much as 70 percent of the state budget had come from international aid. To make matters worse, he came to power during a global economic recession. Detractors say that Rajoelina made the situation worse by undermining Madagascar’s democratic institutions. Upon taking power in March 2009, he dissolved both chambers of parliament. And while he promised to hold presidential elections within a year or two (the promises varied), his transition government ended up lasting five years. Above all, though there was no smoking gun, his critics say he sat at the center of a criminal web spreading from the country’s national parks to the customs offices of China. 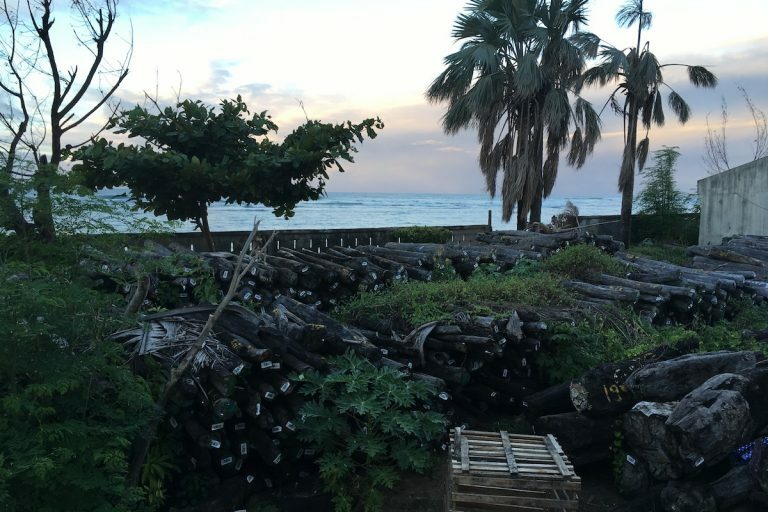 Piles of confiscated rosewood logs outside the provincial forestry and environment office in Antalaha, Madagascar, in 2017. The country is engaged in a long-running debate about how to dispose of confiscated illegally logged rosewood, and its stockpiles are notoriously porous. Photo by Rowan Moore Gerety for Mongabay. Rosewood logging had long occurred in Madagascar but it exploded to record levels during and after the 2009 crisis. Political instability created a free-for-all in the country’s northeastern tropical forests, home to several threatened — and highly valuable — Dalbergia species whose lustrous red wood is used to make traditional furniture in China. Though he often receives the blame, Rajoelina was not responsible for the sudden uptick in trafficking. It was in fact Ravalomanana who started it when, in January 2009, he contravened existing law and granted permission for 13 influential businessmen — Madagascar’s timber barons — to export rosewood for a three-month period. Ravalomanana was desperate for their support as he tried to hold on to power, and he presumably viewed export duties as a source of revenue for his struggling administration. After being forced into exile in early 2009, former president Marc Ravalomanana spent the last decade trying to return to power only to fall just short in last month’s presidential election. Here he appears in Copenhagen, Denmark, in 2017. Image by Mogens Engelund via Wikimedia Commons (CC BY-SA 3.0). If Ravalomanana triggered the rush to the forests, however, it was Rajoelina who kept the loggers there. In August 2009, he issued a broader order allowing the timber barons to export rosewood “in order to calm the economic situation.” He later reversed this measure, but by then the trade was in full swing, and his administration did little to enforce the ban or prosecute the people running the illegal trade. This made him an object of international scorn. 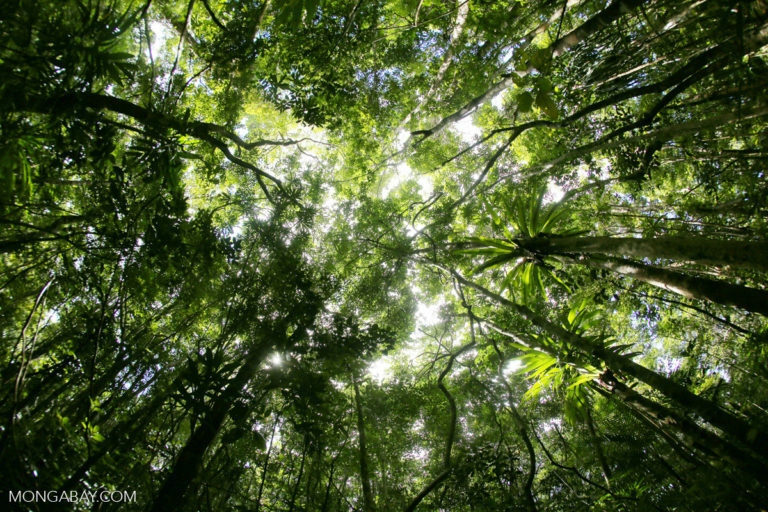 National Geographic ran a long feature story on the rosewood crisis; the U.S. House of Representatives passed a resolution calling for a stop to the illegal logging; and the UN placed Madagascar’s eastern rainforests on its List of World Heritage in Danger. Some evidence suggests Rajoelina may have been personally involved in the rosewood trade. When he left office in 2014, a large pile of rosewood logs was found at the presidential palace. Executives at a rosewood company in Guangzhou, China, said they had known him since he visited Guangzhou while mayor, according to a 2010 reportby the Environmental Investigation Agency and Global Witness, advocacy groups based in Washington, D.C. and London that engage in undercover reporting work. Rajoelina dismissed the report as a smear campaign and has repeatedly denied involvement in the rosewood trade. His communications team did not respond to questions for this article, including about his role in the rosewood trade. Rajoelina has also received criticism for the company he keeps. The most notable example is his longtime adviser Maminiaina “Mamy” Ravatomanga, owner of the Groupe Sodiat conglomerate and listed as one of “ten millionaires from Madagascar that you should know” by Forbes in 2017. Ravatomanga regularly appeared in public with Rajoelina during his first stint in power. Like Rajoelina, he is often linked to the illegal rosewood trade. He is also currently under investigation for tax fraud and money laundering in France. The High Court of Paris recently ordered three properties he purchased near Paris in 2011 seized. Ravatomanga has also been investigated by Madagascar’s anti-money laundering bureau, and at one point was forbidden from leaving the country. Despite Ravatomanga’s troubles, Rajoelina has remained loyal to his backer. In a recent interview with RFI, Rajoelina refused to distance himself from the notorious figure. Rajoelina’s environmental record led a highly regarded scientist to speak out against him prior to last month’s election. A Rajoelina victory would mean “environmental disaster” and a “blow to the survival of nature,” William Laurance, a rainforest ecologist at James Cook University in Australia and a member of Mongabay’s advisory panel, wrote in an op-ed in Al Jazeera. The first round of Madagascar’s presidential election, on Nov. 7, featured 36 candidates. Rajoelina and Ravalomanana, as two well-known and well-funded former presidents, collectively received about 75 percent of the vote, easily outpacing the incumbent, Hery Rajaonarimampianina, and advancing to the runoff on December 19. Neither campaign agreed to make its finances public — despite a request to do so by Transparency International — so it is unknown how much they spent and where they got their funding. Rajoelina ran a slick, well-organized campaign. His team used five helicopters to traverse the country, handing out t-shirts and other swag. (Ravalomanana’s campaign had two helicopters.) In Antananarivo, they paid local people 7,500 to 15,000 Ariary (about $2 to $4) a day to wear “Rajoelina” t-shirts or attend rallies, according to Richard Marcus, an international studies professor at California State University-Long Beach who has researched Madagascar’s politics for three decades and was in the country during the election season. The efforts paid off at the polls, where Rajoelina received nearly 56 percent of the vote to Ravalomanana’s 44 percent. 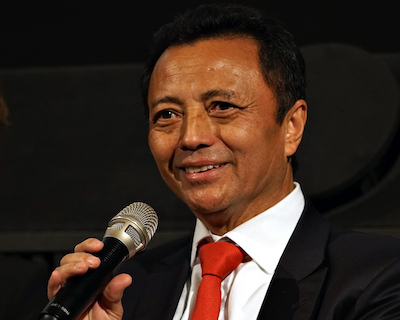 Ravalomanana appealed to Madagascar’s high court, citing hundreds of cases of election fraud across the country. But on Jan. 8 the court ruled that even if the claims were verified, they would not be enough to change the election result as Rajoelina had won by more than 500,000 votes. Several conservationists and international observers told Mongabay that they hope Rajoelina’s upcoming term will be different from his first. Now age 44 and democratically elected, he has an opportunity for a fresh start. During campaign speeches he acknowledged that he had made mistakes and was eager to rectify them. “His campaign was part populism and part mea culpa,” Marcus said. 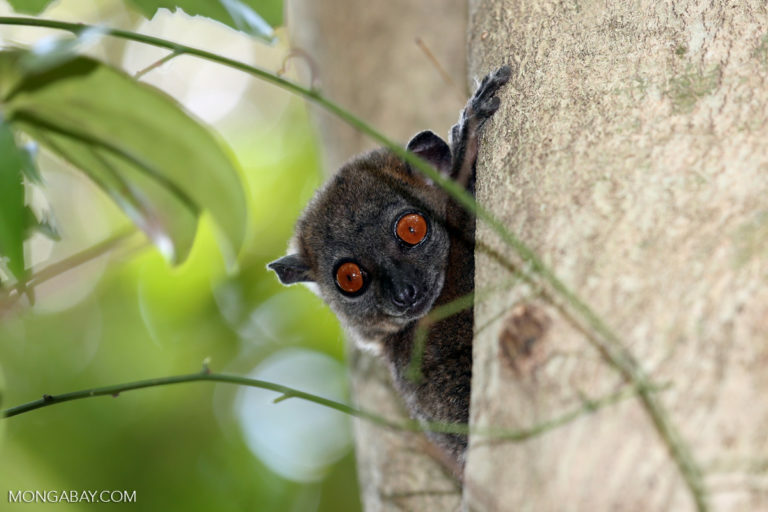 Ankarana sportive lemur (Lepilemur ankaranensis), an endangered species whose habitat is threatened by rosewood logging. Image by Rhett A. Butler. Yet these observers remain concerned. During his first term, Rajoelina proved amenable not just to resource extraction in the rainforests, but also to oil and mining interests, and there is no evidence that his priorities have changed. His online platformindicates that he views increased mining activity as a way of making Madagascar less dependent on foreign aid. The platform does not acknowledge Madagascar’s unique set of ecosystems or set forth a plan for protecting the environment, and the list of natural resource advisers includes no one with a conservation background. His campaign speeches also indicated that mining would be a central pillar of his economic program, according to Zo Randriamaro, coordinator of the Antananarivo-based Research and Support Center for Development Alternatives – Indian Ocean, a civil society group. Randriamaro told Mongabay she worries that Rajoelina will not respect the land rights of local people, who have contested several mining projects across the country in recent years. “[W]e are likely to face even more issues resulting from the planned expansion of the extractive industries…and the dispossession of communities linked with the increasing privatization of land and commons,” she said.